An NHL franchise in its second year of existence is trading away its future assets. This should still be an absolutely baffling sentence… but it’s not anymore. Not after the Vegas Golden Knights rode a massive wave of momentum for the entire 2017-18 season that took them all the way to the Stanley Cup Final. Would they stay the course on their five-year plan after their unexpected first-year success? Heck no! Las Vegas is a city of gamblers, and its hockey franchise should be no different. This is clearly the ethos of general manager George McPhee, who has thrown all caution to the wind and emphatically declared that the Golden Knights are in “win now” mode. Yes, that’s right – the Vegas Golden Knights are all-in. Not for three seasons from now, but for this season and beyond. With the news that the Golden Knights pulled off a midnight trade with the Montreal Canadiens for Max Pacioretty, in exchange for winger Tomas Tatar, forward prospect Nick Suzuki, and a 2019 second-round pick, then shortly after inked him to a four-year extension, a second-year franchise has officially opened its championship window. So… what do they do next? Of course, the original plan was to stockpile so many assets to build a monster for the future, but instead, the Knights are using their bevy of picks and prospects to acquire a proven scorer like Pacioretty. And they might not be done. With “Patches” on board and Paul Stastny brought in this summer as a free agent, the Golden Knights may still be in position to bring in all-world defenseman Erik Karlsson, whom no one expects to last long in Ottawa. 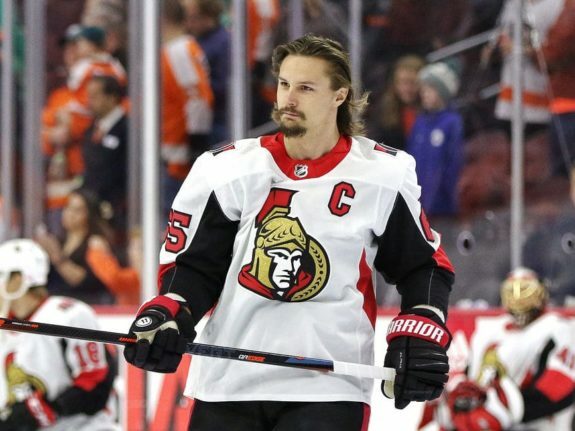 James O’Brien at NBC Sports offered a great take on how the Golden Knights could still make a deal for Karlsson to bolster their blueline, which is currently the team’s biggest concern. Nate Schmidt’s 20-game suspension will be hard to overcome, especially with Shea Theodore’s contract situation still unresolved. 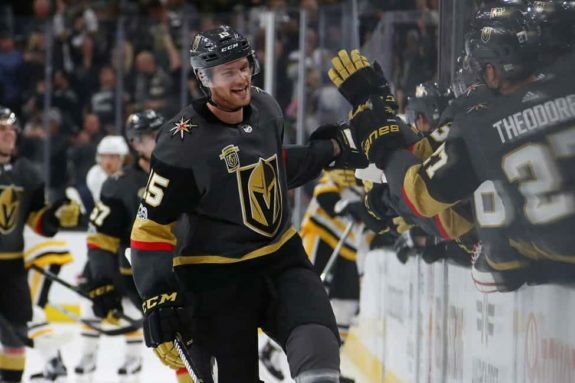 Without Schmidt and Theodore, the Golden Knights have two holes to fill on their opening night blueline, and Karlsson would certainly represent the best option for the club, although he will come at a high price. Luckily, as O’Brien points out, the Senators are strapped for cash, which could play well into McPhee’s gilded hands. Let’s say a deal for Karlsson can’t be reached, what other options do the Golden Knights have? Well, first off, they can look internally. Schmidt, who blossomed into the team’s top D-man with more opportunity to play last season, will be set to return in mid-November. He figures to be another guy that McPhee would like to keep in Vegas for several years to come, perhaps on a deal similar to the one received by Colin Miller. The team clearly would also like to reach terms with Shea Theodore sooner rather than later, although they seem content to wait it out. Players on the current roster like Jon Merrill and Brad Hunt are the likely options to fill in, but perhaps this also opens the door for prized prospects Erik Brannstrom or Nicolas Hague to get at least their nine-game auditions before their entry-level contracts kick in. As for other options? There isn’t much out there. The jettisoned Luca Sbisa is still looking for work and is familiar with the locker room and team’s system. There are other proven veterans in the twilight of their career available as unrestricted free agents, such as Paul Martin, Kevin Bieksa, or Josh Gorges. But it seems likely that the team will roll with what they have unless they can reel in Karlsson. Despite the Pacioretty and Tatar moves, McPhee hasn’t sold off the farm… yet. This is of course pending any Erik Karlsson move, but as of now, the future still looks bright for the Golden Knights. Cody Glass looks like a future star, as does Erik Brannstrom. Nicolas Hague could be an absolute monster on the back end as he fills out his six-foot-six frame. 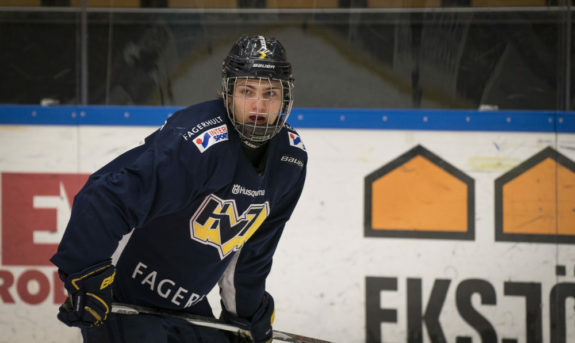 2017 fifth-round pick Lucas Elvenes is already looking like a steal after a great season in Sweden’s top league. Defensive prospect Erik Brannstrom could get a look early this season with the Golden Knights’ defensive corps in question. (Photo: Johan Freijd, HV71). And let’s not forget that KHL star Nikita Gusev is a Vegas Golden Knights property, and could be heading to the desert next season if he so chooses. It will be interesting to see how McPhee navigates the cap moving forward, as next season will be the first time he isn’t completely playing with house money, but these Golden Knights look primed to win now and be competitive for years to come. Vegas seeks to repeat (and improve upon) their miracle first season. The chips are on the table, and the team is showing that they are unafraid to push them toward the middle. The Golden Knights are all-in.